The following is the second in a series of posts on the subscription-based model and open access alternatives, and how each get stuck from their respective ends of the scholarly information supply chain. In addition to the usual disclaimer regarding my own opinions expressed here, these should also not be interpreted as a substitute for legal advice. In my last post I outlined one side of scholarly communication — the subscription renewal process – in underrepresented detail, revealing places where it is stuck in arduous workflow, inefficient systems, and complex, problematic licenses. In addition to pointing out the subscription model’s own struggles, I acknowledge its perpetuation works directly against investment in open access alternatives. Seeing the shared predicament from each respective end, I wondered how these two workflows come together in practice. Beyond our company in misery, this post will explore where collaborations, specifically in the realm of licensing, have made progress toward alternatives to traditional publishing and subscription-based acquisition. Contract negotiation is an activity associated with the subscription model that most often occurs when placing new orders or at renewal. In many cases this responsibility is performed by collection management or acquisitions, usually with support of the institution’s general counsel. Scholarly communication staff also interpret contracts as they assist authors in negotiating publishing terms and retention of authors’ copyright. The scholarly communication office might also be involved in contract negotiation if they are a publishing entity themselves. A third player, interlibrary loan, also plays a role in licensing terms, interpreting copyright and fair use as it relates to day-to-day borrowing and lending, and copyright fee payment associated with these activities. For other obvious reasons, these areas of the library are key stakeholders in the subscription renewal process. If we cancel, what will the faculty reaction be? How will the subscription savings through cancellation effect the cost of ILL? If we renew, what does this say about our efforts in promoting open access? In addition to this, the skillset these faculty share in negotiation and the interpretation of copyright in particular reveals a unique collaborative opportunity for subscription and open access workflows. Bringing these shared skillsets together in the licensing process allows for a more comprehensive awareness of where contracts can restrict rights granted by copyright law. More specifically these perspectives can quickly identify key terms that can best mitigate that risk and influence other favorable objectives. 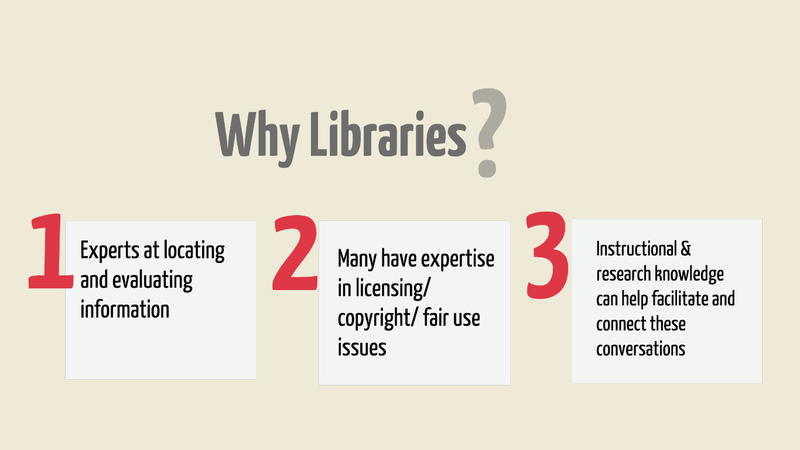 The LIBLICENSE project is an excellent starting point for understanding general license terms and those specific to the needs of libraries. I highlight examples of some commonly sought terms below for which the collaborative contexts I’ve mentioned have been most helpful in addressing. Relevant pages and discussion threads from LIBLICENSE and other resources are linked within. Though many of these terms are generally accepted among the library profession and even have the backing of national and international organizations, publishing and other industries have their own generally accepted clauses and the backing of their organizations. This is why it can be difficult, unrealistic even, for the single acquisitions staff responsible for negotiation to push for all these on her own. A major subscription contract renewal is an important opportunity for many to speak with a unified voice, not just on behalf of buyers and content, but on behalf of authors and of a wider audience of users. In addition to bolstering well known terms and issues, these multiple perspectives are key to introducing new ideas into a traditional negotiation. Sometimes new ideas (and even traditional ones) will not result in accepted contract terms because they are dealt with entirely separately from the renewal process, or because they do not otherwise match the other party’s entrenched business practices. This can be advantageous from a negotiating standpoint, as losing out on some issues can favorably influence the advancement of others. The fact that some issues are perceived as entirely separate from the renewal process can also be advantageous. Author rights, for example, are often handled through individual author contracts or separate institutional open access policy agreements. While this can sometimes prevent their inclusion subscription agreements, by recognizing the separation itself the negotiation lends a stage to raise important issues more boldly without directly jeopardizing the terms of renewal. New ideas I’d like to see in renewal negotiation discussions involve taking what is often the licensee’s obligation and making it a mutual or licensor obligation. One example is caps on changed and added content. Publishers often allow a clause that addresses when a percentage of content lost by a publisher can trigger breach or renegotiation. But aside from title cancellation and swap clauses – which are rare and require a significant amount of time and effort by the library to invoke — there is nothing to prevent a publisher from acquiring and adding content to a package for which the libraries are required to take on in their renewal spend. Another has to do with advance renewal or offer deadlines. As outlined in my previous post, publishers often require advance notice of cancellation, but there is nothing that requires publishers to provide the library with advance notice of major changes that might influence a cancellation decision, like new package offerings or an entirely new license contract. I’d also like to explore clauses that might address the myriad ways payment for published research is replicated across the institution (aka double-dipping), such as with the libraries paid subscription and the author’s open access article processing charges. In any change, the individual and organizational commitment to cooperation can be the hardest, but most important first step. In future posts, I’ll lay out ways organizational structures, workflows and individual skills might lead to more frequent and improved collaborative work on these issues. Breaking the big deal of a major subscription renewal and reinvesting in open access will certainly require a deeper investigation into economics of open access and subscription infrastructure already well-covered by the literature. Perhaps, as with licensing, if we look at these economics more carefully with a different group of eyes and minds, new practical alternatives will emerge. This year, Open Education Week ran from March 9th to March 13th. Open Education Week, like Open Access Week, is a celebration of what has been accomplished and what is currently being done within the greater open movement. The Open Education Consortium sponsors the week by compiling resources, marketing materials, and educational tools for librarians, faculty, and other instructors around the world. One of the best parts about this process is that after the week ends, the Open Education website becomes a repository of sorts for events that happened that year. The resources for each event include recorded lectures and webinars as well as supplementary guides and tools. This year, just the webinar topics ranged from ensuring quality of digital content in the classroom to the impact of the open educational movement on the internationalization of universities globally. This is the first year that UIUC has participated in Open Education Week and I was lucky enough to help create and lead two of our events, which were spearheaded by the Office of Information Literacy. Before I describe my experience with those events, it might be helpful to back up and explain why open education is important, especially within the library community, and what Open Educational Resources (OER) are. SPARC defines OER broadly as any learning resource that is released “under an open license which permits…free use and repurposing by others”. I would argue that the most important word in the last sentence is repurposing. The Open Education movement is built on the idea that education is about sharing, expanding, and refining knowledge. That can only happen if licenses allow educators to revise, adapt, remix, combine, and then redistribute resources. If you take a learning object that another educator created, improve upon parts of it, and then only share it in the classes that you teach, some would argue that you are not fully participating in the Open Education movement. Re-sharing is key. But why does all of this matter? The Open Education movement works to mitigate the legal and technical barriers that impede collaboration and instructors’ ability to create the absolute best learning objects possible. Instructors are often frustrated with traditional learning content platforms, like textbooks and even course packets, which paint their course with a broad brush and often do not allow adaptation and flexibility. Likewise, students become frustrated when they have to buy a $100+ textbook and it is not completely or consistently used. To make the matter more complicated, many educators (including librarians) find fair use law subjective and confusing. OER is a solution to many of these issues. In addition, OER often reduces the costs we put on our students, many of whom are drowning in an incredible amount of debt already. The use of OER has been proven to increase retention and foster equitable access to learning regardless of socio-economic status. Librarians obviously care deeply about both of these goals. My department hosted two sessions, one for library staff and one for instructors across campus. We used the same companion LibGuide for both sessions but the learning outcomes for each session were different. I taught the session for staff and my colleague, Crystal Sheu, taught the session for instructors. It’s important to mention, however, that we created the lesson plans and presentations together and we often consulted each other and our boss, Lisa Hinchliffe, about learning activities and presentation details. I share a few reflections below with the hope that others will think about how this type of programming could affect their library programming and culture and possibly make OER a more central conversation on their campus. Please note that these views are my own. Getting buy-in is difficult! Both of our audiences were definitely smaller than we had hoped. This was our first year doing this type of programming so smaller numbers are to be expected. At the same time, it is important for us to think about why there might not currently be a large audience for this topic. Do faculty already know about OER? Do librarians get enough OER training through their professional development experiences? Do faculty not have the time to find and adapt OER? Are librarians weary of telling their faculty about yet another thing they should think about doing? Should we have used different marketing techniques? I don’t know the answer to any of these questions and I think that’s okay. Still, whenever we do this type of programming, whether it is internal or open to the entire campus, I think it is important to find a deeper understanding about what’s happening. Sometimes there are just odd conflicts or planning issues. But for the most part, there are structural reasons people do or do not find value in something. Even putting the programming out there allows us to gauge our audiences’ interest and then do further research based on that. Somehow it always surprises me just how complicated intellectual property and copyright is. OER definitely attempts to reduce the confusion around the legalities of sharing by using Creative Commons licenses. We introduced these licenses on a very basic level, in case any of our audience members weren’t familiar with them. Nevertheless, even CC licenses can be complicated and require thoughtful planning. One great example is the Share-A-Like license. We tried our best to tell participants that Share-A-Like requires intentionality. When you take an OER (or any licensed material) under a Share-A-Like license and adapt it, reuse it, and then share it again, it has to be licensed under the same original license you started with, which is obviously some variation of a Share-A-Like license. When I first learned about this license, I was excited about its function. On face value, the license seems to take a major tenant of the open movement and put it into practice. If you use something that someone else has spent time and energy creating, you, too, should share your final product openly. Yet, a more critical look of this license paints a more nuanced picture. By making openness “infectious,” we take away the creator’s ability to choose how they would like to share and disseminate their work, which (I believe) is one of the most important reasons we have become author rights and open access advocates. Note: this assertion is most definitely being influenced by some of the resources I have been exploring lately, including one of the best critiques of openness and assuming openness is always the best option that I have ever read and a project that contextualizes information instead of assuming that it should always be free and open to all, specifically in regards to cultural heritage objects that have historically been attained through violent and colonialist means. I also recognize that “open” often means different things when thinking about educational resources, publications, cultural object, data, code, and software and we can’t group them together. While I think sharing is the point of OER, I’m not sure licensing is the place we should force educators to do it. I’m currently taking a data policy seminar with Victoria Stodden. A trained statistician with a legal background, Dr. Stodden has been an incredible advocate for the open science movement. She regularly speaks about sharing data, code, and software to increase reproducibility and progress within the scientific community. Our last class session focused on intellectual property, with a more specific focus on licensing data and code. The Share-A-Like license came up in our conversation and, of course, I was a huge proponent for it. I explained that in a movement like Open Education, where the goal is to take some power and autonomy back from the commercial entities that make textbooks and other learning materials, Share-A-Like is imperative for making sure that no one is selling OER that have been adapted downstream. Her point, however, was that Share-A-Like actually impedes the OER movement to some extent. She argued that if an instructor finds two OER under different Share-A-Like licenses, they can’t combine these two resources and re-share whatever they make. Why? Because both licenses require you use that same license and you can’t use two licenses on one OER. This is getting confusing, right? My point is simply that as we embrace CC licenses, many of which make our lives easier and make sharing less complicated, we need to continue to be critical of their purpose. Likewise, we need to teach instructors that CC licenses aren’t a quick fix for everything but instead one option in an entire toolkit of legal resources. Moreover (and this is my epiphany from Open Education Week), every library that expects to do robust outreach around OER or OA needs to have at least one person on staff that understands some of the intricacies of copyright and intellectual property rights. This brings me to my next point. Before really starting OER outreach, your library should start to think about what kind of infrastructure it has to support such a movement. It is difficult to get people excited about an OER initiative when there isn’t much in place within the library to help get it off of the ground. Now obviously some libraries have more resources than others. But I’m suggesting you ask the same questions you ask before you start any outreach, including everything from information literacy sessions to collaborations with other campus programs. Who will be the primary contact person for OER? In other words, who is the face of the library’s initiatives in this area? If you have a strong subject specialist model, how will the library foster collaboration between OER experts and subject specialists? What forms of internal training are needed? Similarly, who will be the point of contact for IP and copyright issues (if there isn’t one already)? Is this person familiar with OER and CC licenses? What’s really challenging is that the library needs to help instructors with copyright, instructional design, and technology. This means that teamwork and internal communication is essential. I believe that one of the most important forms of infrastructure in the OER conversation is the University IR. If we are telling instructors that sharing and re-sharing is important, are we backing that claim up through our resources? Many institutions, including the University of Michigan and MIT, have repositories for their OER. This fosters internal collaboration and sharing, especially when two instructors might teach a similar class and learn from each other. Additionally, most (if not all) of these institutional repositories for learning objects are open to non-affiliates, which aligns with the greater open movement. I’m not suggesting that learning objects have a place in the IR that usually holds research materials. But there needs to be an outlet or service for instructors that would like to go beyond disciplinary or general OER sharing. The session aimed at staff really surprised me. We based our lesson plan on the standard subject specialist model: you talk with your faculty about OER and teach them the standard process of finding, evaluating, and repurposing OER for their classroom. Our participants had much more nuanced and complicated reasons for using OER. Some examples include using OER as a solution to sharing educational materials internationally. We often think about this as giving others access to our OER but I think we have just as much to learn from their learning objects. Covering this intended use meant taking a minute to talk more explicitly about access and repositories in other languages. An additional use that we hadn’t thought of was using OER when working with unaffiliated patrons at the reference desk. Because of the size of the library and our great VR service, Illinois often gets questions from around the nation and world. Community members are also some of our most regular patrons. We are often able to help patrons with their needs, but if they do not have access to our electronic or physical collection, OER could be a potential resource for their question because they can be accessed by anyone. The Office of Information Literacy recently applied to present some of this information at Illinois’ Faculty Summer Institute (FSI). If we are accepted, our primary audience will be faculty members that have applied to be a part of the institute in order to learn more about new instructional movements at Illinois. Our goal for this session is simply to go beyond consumption. The two workshops we just taught were primarily based on how to find, evaluate, and use others’ OER. But what if you have an existing learning object you’d like to share as an OER? What is the right venue for you? How can you use your subject expertise to create metadata and documentation that allows re-use by others? What license fits your needs? Our profession is continuing to teach students and instructors that they aren’t just consumers of information. They create and disseminate information every day. Our hope is that faculty are see the value in sharing their expertise with others teaching within their discipline. Libraries are apt to do this work! I made the following graphic for my session with staff. I think that it’s important to keep all of these in mind when doing open education work. We are experts in many of the areas OER touch upon! Our time at the reference desk is often spent locating hard-to-find information through a variety of sources. We teach information evaluation everyday. Many of us have some expertise or understanding of copyright and/or copyleft. We are trained in instructional design and instructional technology; we spend a lot of our time crafting learning outcomes and identifying activities and assessments that can foster experiences that address these outcomes. We have all of the tools we need to be conversant with faculty, staff, administrators, and colleagues about the need for open education and the use of OER. It is time for us to embrace the Open Education Movement as a valuable tool for increasing access to education, improving learning, and furthering the mission of the campus library. A special thanks to Lisa Hinchliffe for letting me explore my interest in OER. Thanks, too, to Crystal Sheu for collaborating with me to make this vision a reality. Thanks to Sveta Stoytcheva, Kyle Shockey, and the Twitterverse for pointing me to the awesome critiques of openness discussed above. My head’s been buzzing since I first read yesterday on the New York Times Bits Blog that coder and activist Aaron Swartz was indicted under federal hacking laws for illegally downloading millions of articles from JSTOR (the full text of the indictment is embedded at the bottom of the post). Since then I’ve read through lots of articles and tweets, news about the case having all but taken over my Twitter stream, including a more in-depth story in today’s Times. And I’m finding that with every article I read I have more questions than answers. Why’d he do it? Swartz is well known as an information activist and open access advocate, so this question’s not hard to answer. I’d hazard that it’s also not a stretch for many librarians to sympathize with Swartz at least a little bit. After all, we spend our days helping people find information, and we know all too well the frustrations of not being able to access the information we and our patrons need. I’ve read that Swartz wanted to use the data for research, but as JSTOR points out in the official statement, there are procedures in place for scholars who want to use large parts of JSTOR’s database for research. Swartz used guest accounts to access the network and is not accused of finding a security hole to slip through or using stolen credentials, as hacking is typically defined. On the other hand, Demand Progress, the progressive political organization founded by Swartz, has compared Swartz’s actions to “allegedly checking too many books out of the library” (a quote that’s been heavily retweeted). Of course, this analogy doesn’t really hold up, since books and databases operate under very different ownership models. Why JSTOR? I’d guess that this is a question only a librarian would have, but I can’t help wondering why JSTOR? Why didn’t Swartz pick on one of the giant scholarly journal publishers with well-publicized huge profit margins? Perhaps JSTOR was easiest for him to access? Or maybe, because JSTOR isn’t one of the biggies, he suspected that if he got caught they wouldn’t press charges? It’s been reported that JSTOR secured the return of the downloaded content and did not press charges; the case is being brought by the U.S. Attorney’s Office. What does this mean for libraries? And for the open access movement? As I was sitting down to finish writing this my CUNY colleague Stephen Francoeur sent out a link to this post on the Forbes blog that terms Swartz’s actions “reckless and counterproductive.” The post gets at something that’s been nagging at me since yesterday: it points out the possibility that the reputation of the open access movement could be damaged by association. And I’m still not sure how exactly to articulate it, but I worry that there may be fallout from this event that could have a negative effect on academic libraries, too. –The mobile phone (or its descendant) will be the primary access point to the Internet by 2020. –Social networking won’t increase tolerance. It might even polarize people into less tolerant camps. –The original architecture of the Internet will not be replaced, but will be enhanced by research. –Attempts to control access to content will continue to be challenged in an ongoing battle between intellectual property owners and users. I’ve been thinking about this last point quite a bit since the Google settlement. I was very struck by a comment made by Brewster Kahle of the Internet Archive, interviewed in the Mercury News after the deal was announced. He accused Google of breaking the model of the Internet, “trying to build a walled garden of content that you have to pay to see.” My first thought was “our libraries are full of enormously expensive walled gardens.” How did we let that happen? I recently reread Rory Litwin’s 2004 essay on Google and the Monetization of libraries, and found it very thought-provoking. But it’s not just the Googlization of libraries that worries me. Are academic libraries building collections for the future and for all to use, or are we content to simply rent access temporarily for a limited audience? If we won’t stand up for free and equitable access, who will? To be sure, we’ve partnered with scholars to push for open access, particularly to STM research. But I’m baffled when libraries pay money to subscribe to commercial versions of public databases like PubMed, ERIC, and NCJRS Abstracts, teaching our students to use interfaces that we think are better, but which they can’t access once they graduate. Lifelong learning? Pfui. 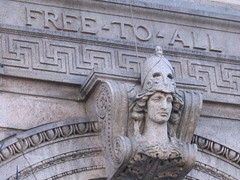 Free to all? Feh. When did we decide libraries are no longer a commons but a go-between that rents temporary membership in publishers’ walled gardens? Did we even notice? Some quotes from the Pew report are worth thinking about. â€œThere will be cross-linking of content provider giants and Internet service provider giants and that they will find ways to milk every last â€˜currency unitâ€™ out of the unwitting and defenseless consumer. If that’s the Internet in 2020 – where will libraries be? Will any of our traditional library values remain intact?